The TEV protease is a highly site-specific cysteine protease that is found in the Tobacco Etch Virus (TEV) often used for easy tag removal. One unit of Biomol Razor™ TEV Protease cleaves >85% of 3 µg of control substrate in 1 hour at 30°C. Due to its sequence specificity TEV protease is far more stringent than factor Xa, thrombin, or enterokinase. Thus TEV protease is a very powerful reagent for cleaving fusion proteins. TEV protease recognizes a linear epitope of the general form E-X-X-Y-X-Q-G/S (Glu, X, X, Tyr, X, Gln, Gly/Ser). TEV protease cleaves between Q (Gln) and G (Gly) or S (Ser). The canonical sequence is ENLYFQS with N (Asn) exchangeable to essentially any other amino acid. Since TEV protease is a cysteine protease its activity is not affected by serine protease inhibitors, although the enzymatic mechanism reminds of the catalytic triade found in serine proteases. PMSF, AEBSF or Pefabloc SC (1 mM), TLCK (1 mM), Bestatin (1 mg/mL), Pepstatin A, EDTA (1 mM), and E-64 (3 mg/mL) do not affect the catalytic activity of TEV protease. Zinc ions inhibit the activity of TEV protease at concentrations of 5 mM or greater. Biomol Razor™ TEV Protease contains a N-terminal polyhistidine tag (28.6 kDa). It contains a mutation at position 219 (S219V) that renders the TEV protease immune to autoinactivation. The standard reaction buffer for TEV protease is 50 mM Tris-HCl, pH 8.0, 0.5 mM EDTA, 1 mM DTT. Incubation should taake place at 30°C overnight, while most cleavage will occur during the first hours. It can also be incubated at room temperature or 4°C with an acceptable loss of activity. How Much TEV Protease to Use? Rule of thumb: Use 1 µg TEV protease per 25 µg to 100 µg of substrate (minimum enzyme concentration: 1 unit/mL). Use more enzyme, if the cleavage site of the substrate is occluded sterically or the substrate is aggregated. Under these conditions, it may help to add a stretch of glycines, or histidine or a flag tag between the TEV cleavage site and the N-terminus of the target protein. On column cleavage is not recommended. TEV protease has a relatively flat activity profile at pH values between 4 and 9 (best pH 6.0 to 8.5). It is half as active on 500 mM sodium chloride as in its absence. It is maximally active at 34 °C. It tolerates a range of buffers substances like phosphate, MES or acetate. Glycerol or sorbitol can be added up to 40% (w/v). Detergents may affect activity. If the target protein is expected to contain disulfide bonds, DTT should not be used in the reaction. Use 3 mM glutathione/0.3 mM oxidized glutathione instead. If your target protein contains zinc fingers, it might be a good idea to replace DTT with beta-mercaptoethanol und to replace EDTA e. g. with citrate. How to Get Rid of TEV Protease After Digest? If your target protein does not contain a polyhistidine tag, use an appropiate affinity resin to bind the polyhistidine tag of Biomol Razor™ TEV Protease (DTT and EDTA should be removed first). Product information "Razor(TM) TEV Protease"
Ready for use. Recombinant TEV protease with an N-terminal His-tag for simple removal from the cleavage reaction by immobilization on metal-affinity resins. TEV protease recognizes a linear epitope of the general form E-Xaa-Xaa-Y-Xaa-Q-(G/S), with cleavage occuring between Q and G or Q and S. The most commonly used sequence is ENLYFQG. 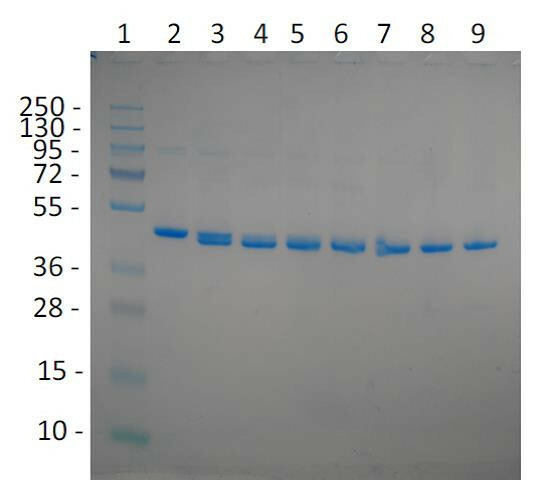 This TEV protease contains a S219V mutation against autoproteolysis (self cleavage) and for increased catalytic activity and efficacy compared to the wild type enzyme. It is mainly used for removing affinity tags from peptides. Affinity tags are often applied to facilitate the expression and purification of recombinant proteins. Whereas many tagged proteins retain their structural integrity and biological activity, others clearly do not. Therefore, whenever possible, it is prudent to remove tags from recombinant proteins. The tobacco vein mottling virus (TVMV) protease is a close relative of TEV protease but, with a distinct sequence specificity. Customer review for "Razor(TM) TEV Protease"